Community gardens can be a great way to bring neighbors together. Groups share in the work (maintenance) and rewards, the fruits (and vegetables) of their labor. Many types of groups have become involved in community gardening, such as homeowner associations, neighborhood block groups, educational institutions, social service agencies, correctional institutions, corporations, religious organizations, and gardening clubs. 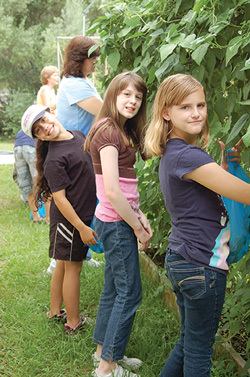 These groups are interested in creating and maintaining community gardens because participation increases self-esteem, confidence, and encourages youth to become involved. Groups create beauty, grow edibles, improve their nutrition and fitness, reduce stress, are neighborly, and promote healthier communities. Initial planning and communication are keys to successful community gardens. There are several questions that need to be answered before starting a community garden. These questions include: Is there sufficient interest? What are the goals and purposes of the groups? Where will the garden be located? Who has rights to access and use the land? How will the property be planted and maintained? What tasks need to be done and by whom? How do you want to operate? What are the financial needs to create and maintain the garden? How will funds be raised? What are the legal issues? How will members communicate with each other? What will the garden be named? If there is sufficient interest and the other questions above have been addressed, permits will need to be secured (fence, well, tool shed construction, etc.). A management team needs to be identified/selected/elected, garden guidelines established, an application form and process created that includes a release from liability and an agreement form (with legal review and approval). A sample budget should be created as should a document that covers the community garden rules and regulations. This document would contain information about fees, maintenance, community areas, trash disposal, prohibited activities, pets and children, watering rules, security, cars and parking, tools, being considerate, and other items as needed. There are two management approaches to community gardens. These approaches are individual plots and common greenspace. For individual plots, the area is subdivided per personal use. This approach is generally used for vegetable gardening. The plots can be chosen, randomly selected, or assigned. The common greenspace approach involves members managing one specific area. This approach is generally used for a variety of garden types; such as ornamental landscapes: beautification and landscape clean-up; educational gardens: for job training, horticulture demonstrations, and outdoor classrooms; and entrepreneurial gardens: shared profits from garden product sales. Site selection is very important. A minimum of six hours of full sun is needed. The site should have appropriate zoning and legal restrictions, sufficient space (minimum of 5,000 square feet), access to water, well-drained soil, free from tree/large plant roots, and a “clean” history (free from contaminants or other environmental concerns). You will need to determine how vandalism will be prevented and/or addressed. A shaded area should be available for resting, space for a tool shed, parking, possibly restrooms, power if needed for the water supply, and a plan on how to manage debris. Site preparation involves vegetation and debris removal, fencing installation, staking of plots/paths, soil amended and tilled, or raised beds built/purchased and filled, soil testing completed, and irrigation installed including the required backflow prevention. If you are interested in creating a community garden, contact your local UF/IFAS Extension county office. We don’t provide the labor, but do have information and experience to assist you, including topics that range from horticulture to irrigation system design, food preservation and nutrition. For more information, please see the University of Florida publication from which this article was adapted, “Starting a Community Garden,” by Eva C. Worden, Adrian Hunsberger, and John McLaughlin, at: edis.ifas.ufl.edu/pdffiles/EP/EP12400.pdf, and the Community Garden “Starter Kit,” which can be accessed at: duval.ifas.ufl.edu/documents/CommunityGardeningStarterKit_FINALCity.3.27.13.pdf. EDIS – Online University of Florida publications on gardening; pest management; food preservation and safety; youth, etc. As always, follow the landscape or architectural control procedures in your deed restrictions before making changes. For more information about the nine principles of the Florida-Friendly Landscaping™ Program or for assistance with gardening-related questions, contact your local UF/IFAS Extension office and/or visit the University of Florida websites: solutionsforyourlife.com and edis.ifas.ufl.edu.